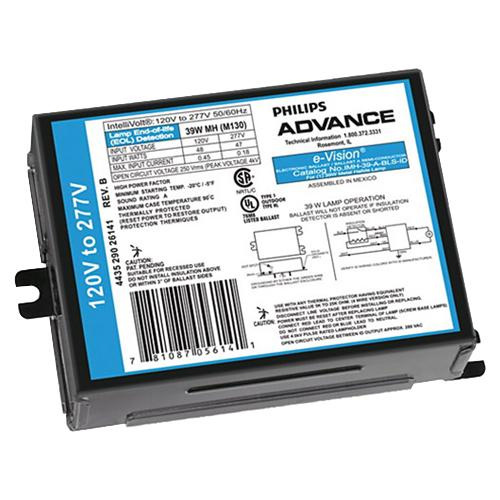 Philips Advance E-Vision® Low frequency HID electronic ballast is suitable for use with one 100-Watt metal-halide lamp. It has voltage rating of 120/277-Volts and current rating of 0.92/0.4-Amp. The C90/M90, M140, C191 ANSI coded ballast has 18-AWG stranded wiring. This bottom lead with stud mountable ballast operates at frequency range of 50 - 60-Hz. Ballast with 0.9 power factor, takes 1200 secs of ignition time. It features metal D enclosure that ensures optimal thermal dissipation. Ballast measures 4.7-Inch x 3-Inch x 1.5-Inch. It allows for low-frequency lamp operation. Ballast withstands temperature rating of 85 deg C. It is ideal for retail display, accent lighting in both track and downlights, lobbies, atriums, landscape and facade lighting. HID Electronic ballast is UL listed, CSA certified and RoHS compliant.